So in a strange twist I had two relatively free weekends recently. That just doesn't seem to happen very often anymore. I especially don't seem to have time to weave or, what is probably more accurate to say, I don't set aside time for basket making. On the first of my free weekends I made a cute little basket from a kit I purchased from Gail Hutchinson at the Missouri Basketweavers Guild Convention a few weeks ago. 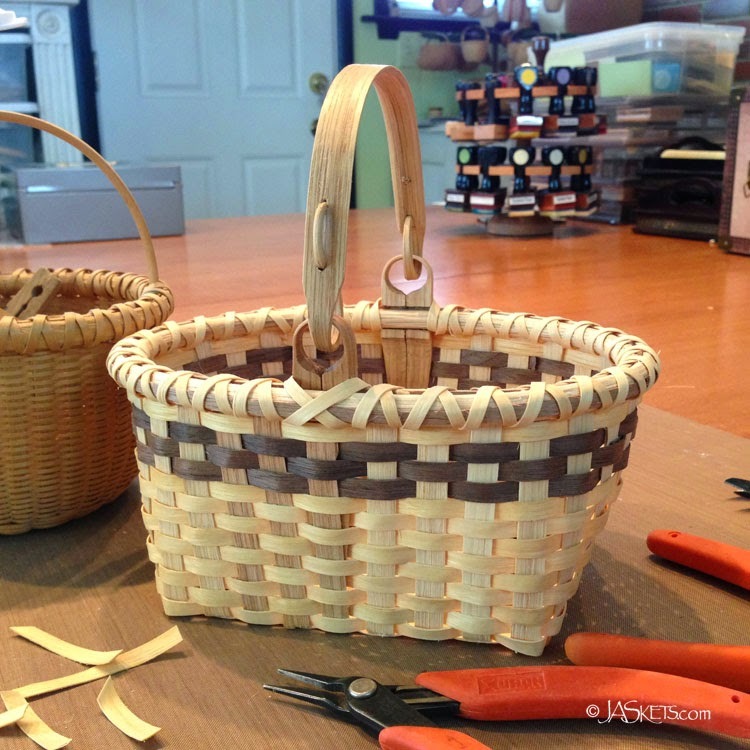 The basket is woven of American elm and walnut with white oak swing-handle and rims. Gail calls this her All American Berry Basket and it is about 5.5" x 7.5". Nearly every basket I have made over the last 20 year has been woven over a mold, so free weaving this basket was a change of pace for me. 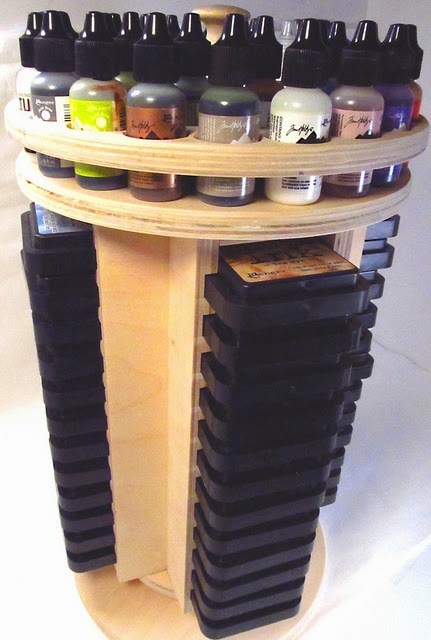 So a couple of years ago I was reading the blog of Jim the Gentleman Crafter and saw this cool ink storage unit. 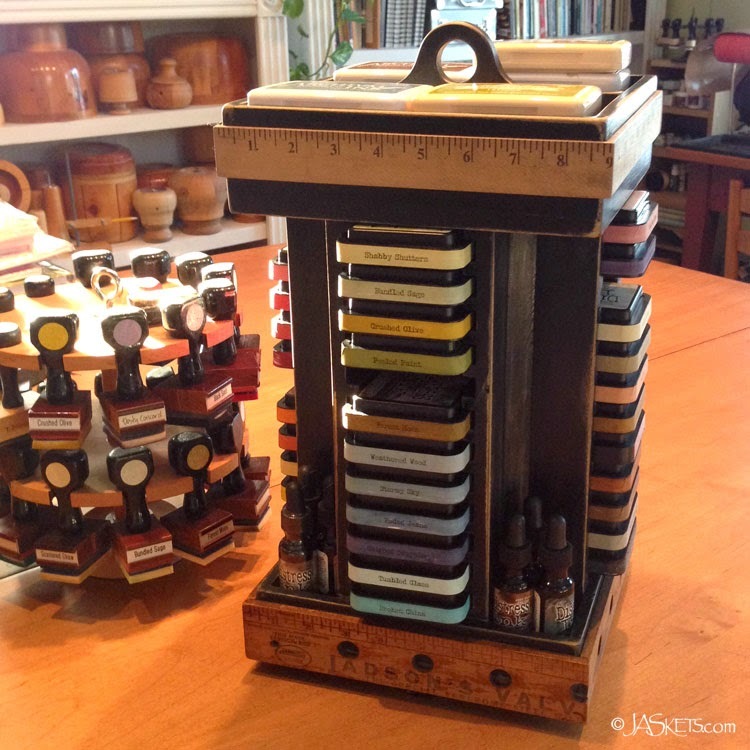 It is one is designed to hold Tim Holtz Distress Ink pads and Adirondack Alcohol Ink bottles. At the time I was just starting to use Distress Ink, so didn't have that many colors, but still thought this was a pretty swift storage option. As I added to my stash of ink pads I tried a number of different storage options, but all required lots of digging to find the color I needed. So, after getting a new router table awhile back I finally decided to try my hand at making my own. Now this was completely on a whim. I really hadn't planned on getting up and making this, so I was just working with scrap plywood, poplar, pine and maple I had on hand. I wish I would have taken some step-by-step pics, but I was in the zone and kind of adding pieces without a real plan. I just knew that I wanted it to hold 48 Distress Ink pads, anything else was just a bonus. Here it is after the first day of work. I figured I would sleep on it and mull over what I wanted to do next. The next morning I had a bit more of a mental plan of where I wanted to go next. 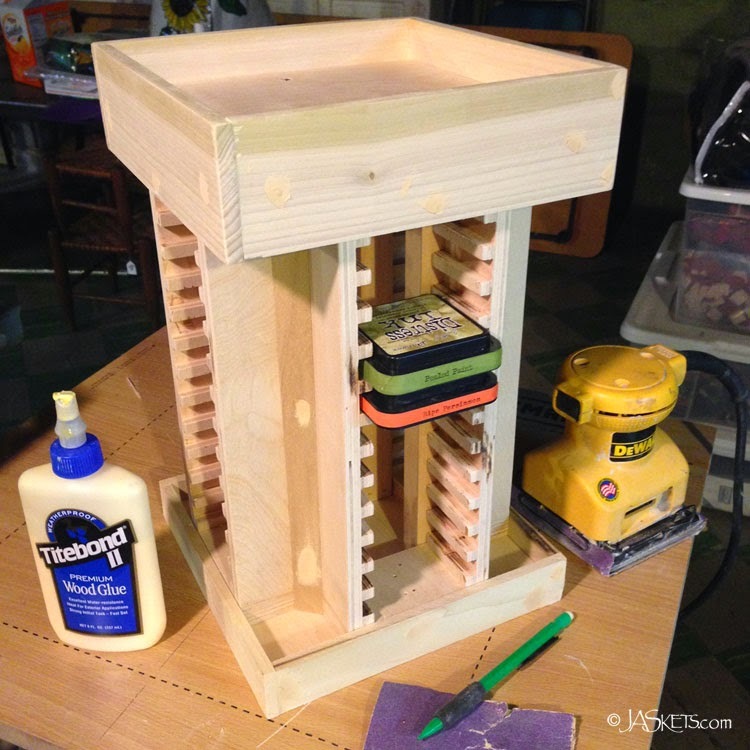 I didn't have a lazy Susan spinner part, so would have to make a run to Home Depot for that. 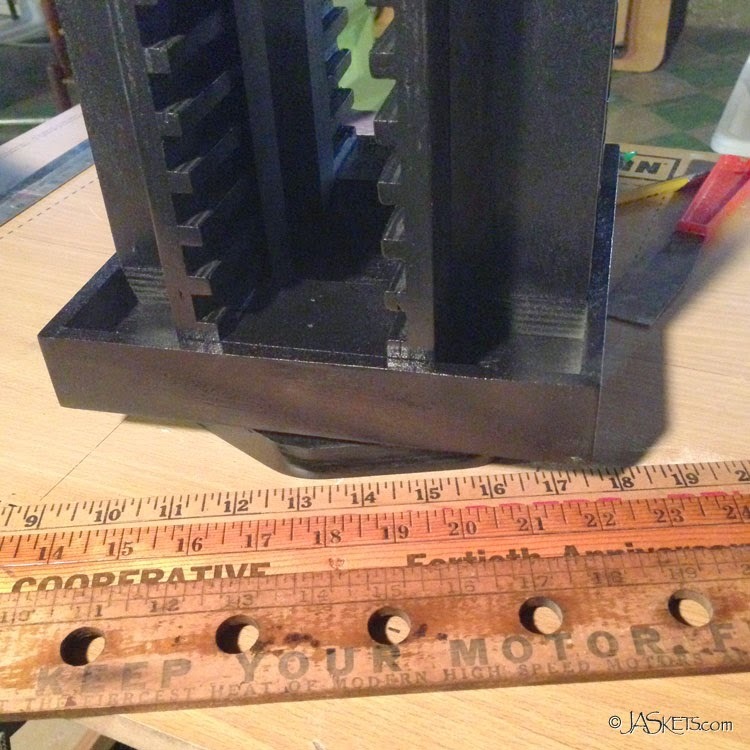 I decided that I would use spray paint to prime and at least give it a first coat of black paint. Typically I would use black acrylic paint for a wood project like this, but there were just so many nooks and crannies that the thought of brushing the whole thing was daunting. The black spray paint I picked up at Home Depot, even though it was supposed to be semi-gloss, was really shiny. Even so, it covered well, so I wasn't going to need to give it a coat of acrylic. I knew I wanted to distress the piece, so was going to sand through some of paint along the edges, but with the way the paint looked I was going to have to sand every square inch. Ugh. I have been collecting old yard sticks for awhile now for some future project and this seemed like the perfect place to use them. A lot of the yard sticks are advertising items, so have cool writing on them. I was a bit nervous about cutting them up so measured and hand cut each section as I went. Here is the "final" assembly, painted, sanded and waxed (I may add more stuff at some point). As I said, I was just adding pieces as I built it, so I didn't plan any of the extra spaces to hold anything specific. The only thing I knew from the beginning was that it needed to hold the 48 colors of Distress Ink pads. If I had known what I know now I would have made the top and corner spaces a hair bigger, then four reinkers would have fit in each corner cubby and six stacks of Archival pads instead of four would have fit on the top deck. I was so pleased with how the spinner turned out that I was already thinking about how I could make one of these for a couple of my stampin' buddies. I posted a picture on Instagram and Facebook and had a nice response. Then my friend, Jim Hankins (The Gentleman Crafter), shared it on his own Facebook page and the interest exploded. I need to make another prototype with the revisions I want to incorporate and figure out how much the raw materials will cost.